EN 60793-2-10 ed. 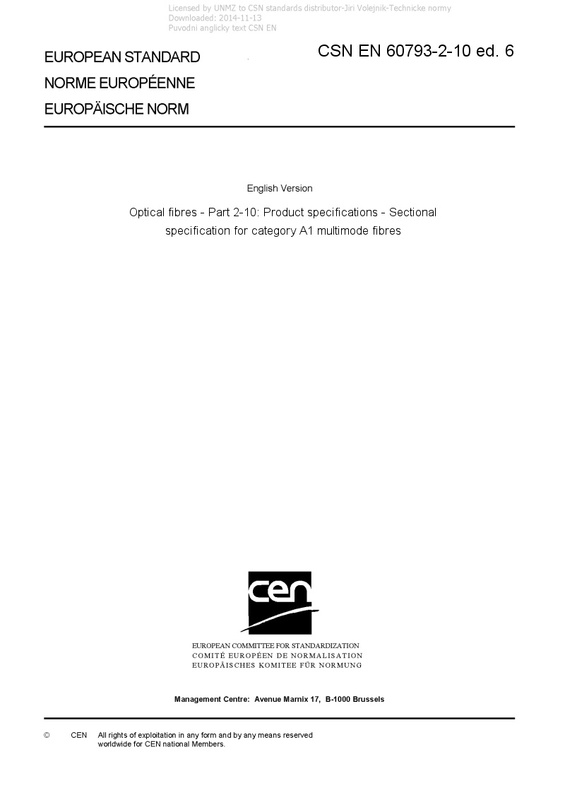 6 Optical fibres - Part 2-10: Product specifications - Sectional specification for category A1 multimode fibres - IEC 60793-2-10:2017 is applicable to optical fibre sub-categories A1a, A1b, and A1d. These fibres are used or can be incorporated in information transmission equipment and optical fibre cables. Sub-category A1a applies to 50/125 mm graded index fibre. Four bandwidth grades are defined as models A1a.1, A1a.2, A1a.3 and A1a.4. Each of these bandwidth grades is defined for two levels of macrobend loss performance that are distinguished by "a" or "b" suffix. Those models with suffix "a" are specified to meet traditional macrobend loss performance levels. Those models with suffix "b" are specified to meet enhanced macrobend loss (i.e. lower loss) performance levels. Model A1a.4 supports single wavelength or multi-wavelength transmission systems in the vicinity of 850 nm to 950 nm. Sub-category A1b applies to 62,5/125 mm graded index fibre and sub-category A1d applies to 100/140 mm graded index fibre. Other applications include, but are not restricted to, the following: - short reach, high bit-rate systems in telephony, distribution and local networks carrying data, voice and/or video services; - on-premises intra-building and inter-building fibre installations including data centres, local area networks (LANs), storage area networks (SANs), private branch exchanges (PBXs), video, various multiplexing uses, outside telephone cable plant use, and miscellaneous related uses. Three types of requirements apply to these fibres: - general requirements, as defined in IEC 60793-2; - specific requirements common to the category A1 multimode fibres covered in this document and which are given in Clause 5; - particular requirements applicable to individual fibre sub-categories and models, or specific applications, which are defined in the normative specification annexes. This sixth edition cancels and replaces the fifth edition published in 2015. This edition constitutes a technical revision. This edition includes the following significant technical changes with respect to the previous edition: addition of model A1a.4 fibre which supports single wavelength or multi-wavelength transmission systems in the vicinity of 850 nm to 950 nm.